3D Printing, Intellectual Property and Innovation evaluates the tensions created by 3D printing (3DP) technology in the context of growing global economy. The term ‘3DP’ (or, more correctly, additive manufacturing) refers to the software-driven technologies that create physical objects by successive layering of materials. As a result of the improved quality of objects produced and lowered processing costs, the availability of these technologies has caused major implications not only for manufacturers and distributors but also for users and consumers, raising unprecedented challenges for IP protection and enforcement. 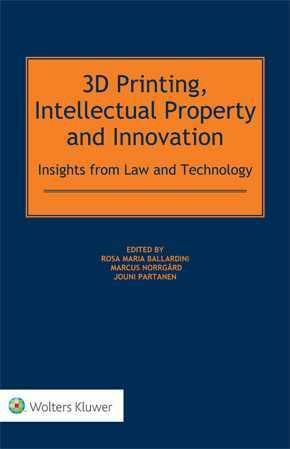 This is the first book to discuss 3DP technology from a multidisciplinary perspective that encompasses law, economics, engineering, technology and policy. Originating in a collaborative study spearheaded by the Hanken School of Economics, the Aalto University and the University of Helsinki in Finland, and engaging an international consortium of legal, design and production engineering experts with substantial contributions from industrial partners, this book fully exposes and examines the fundamental questions related to the nexus of IP law, emerging technologies, 3DP, business innovation and policy issues. traditional trademark infringement in the 3D printing context. Specific industrial applications – including aeronautics, automotive industries, construction equipment, toy and jewellery making, medical devices, tissue engineering and regenerative medicine – are touched upon in the course of analyses. In a legal context, the central focus is on the technology’s implications for US and European IP law, particularly in patenting bioprinting technologies. As a multidisciplinary approach combining the fields of engineering, law and business, this book provides suitable solutions both on how to navigate the IP risks involved with 3DP and on how to further develop and interpret the existing IP rules in the context of 3DP. This work, thus, serves as a peerless resource for patent, copyright and trademark attorneys and other corporate counsel, innovation economists, industrial designers and engineers, and academics and policymakers concerned with this complex topic.